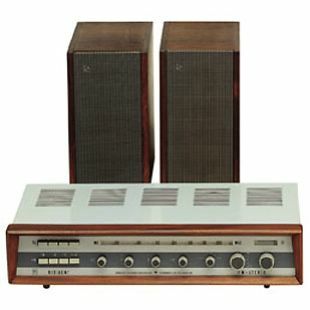 The Dirigent was the first 'designer hi-fi system' and included a choice of components to make up a personalised stereo system.
" You simply have to see the Dirigent and try it out for yourself if you are to realize fully what this remarkable set will do for you. The Dirigent is a compact combination stereo amplifier and FM radio with fantastic control facilities. With it, you can control from any place in the room a wide range of entertainment equipment: the built-in speakers of TV and radio receivers, a tape recorder, a record player as well as a B&O echo unit and additional external speakers, in both monaural and stereo reproduction. The stereo amplifier delivers approx. 4 watts of output power on either channel (2x4 watts in monaural reproduction) and the obsolescence-proof FM radio (prepared for coming stereo broadcasts) has extra high sensitivity, automatic frequency control, magic eye, three stages of IF amplification, etc. The Dirigent has been acclaimed by hi-fi and stereo enthusiasts now at last they have an ideal chance of composing a really versatile entertainment system. The long low elegant shape of the cabinet (available in teak or rosewood) and its small physical dimensions (481 mm wide, 253 mm deep, 113 mm high) make it easy to place wherever convenient. " The Dirigent component system - Beosystem Dirigent - won the iF Design Award in 1963. Signal-to-noise ratio: 26 dB at 2 microvolts. 22.5 kc/s deviation. Output power: 2 x 4 W max.